Medicine and Technology: Double Hand Transplant! Wow, the University of Pittsburgh is keeping busy these days! CNN has an exciting story about a pastry chef who received a double hand transplant. Can you do that? Apparently you can. Advances in surgical technology and microsurgery techniques have made this possible. Jeff Kepner is 57 and he went through a nine hour surgery that was led by Dr. W. P. Andrew Lee, chief of the division of plastic surgery and professor of surgery and orthopedic surgery at the University of Pittsburgh Medical Center (UPMC). 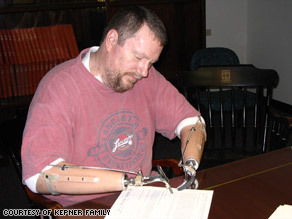 This was the first double hand transplant to take place in the United States. What other transplants will we be seeing in the future? A man who lost both hands to an INFECTON - and now they are doing a bone marrow transplant to augment an ELECTIVE hand transplant procedure that requires lifelong IMMUNOSUPRESSION? The patient may THINK that he knows what he and his family are in for . . . the medical team surely does. Where have medical ethics gone? I wonder at the lack of interest and/or unwillingness to discuss medical ethics. Perhaps there are too many ethical issues to discuss. If we begin the ethical discussion, then it may never end as we migrate from one ethical issue to the next. Responding to Dr. Kim, I feel like there is a general unwillingness to substantively discuss ethics throughout medicine that has far reaching impact beyond "is it right or wrong?" and "yes, we can, but should we?" I know that ethics can be a convoluted and involved subject. Not addressing the issue because it is so complicated, however, is much like saying that we shouldn't address cancer because it is a highly multifaceted disease with no single simple answer. I think that medical ethics, and the acompanying unwillingness to carry out open and engaging debate is costing us all. It costs the healthcare industry because the unethical behaviour of a few results in a perceived lack of ethical behaviour across the industry. Unwillingness to discuss the ethics of such behaviour results in unethical individuals going unidentified until their behaviour is so egregious it cannot be ignored. A failure to have clear ethical standards in place costs the patients because of the questions regarding practitioner motivation that are engenderd about decisions regarding care recommendations. Necessary care can be delayed or foregone and unnecessary care can be bought at a steep price when the consumer is not convinced of the ethical motivation of their care provider. There are economic impacts that cost our society dearly as individual practitioners and patients, stumble through a system in an inefficient, often undirected manner. Sorry about the rant. I do feel that we are approaching a cliff where decisions will be imposed upon patients and practitioners because of an unwillingness to discuss these topics. It seems clear to me that we cannot continue unfettered along our current path.